Selecting a quality mattress is essential for a good night's sleep. It's crucial to match the mattress to your sleeping style. This buying guide explains the "sleep cycle", why it's important and how to choose the right mattress for you. Stage 1: Relatively light sleep, transitioning from wakefulness and sleep. Muscle activity slows and most awareness of the surrounding environment is lost. Stage 2:True sleep lasting about 20 minutes, the largest part of the sleep cycle. Your body temperature drops, while breathing and heart rates slow down. All awareness of your environment is lost. Stage 5:Rapid Eye Movement (REM) sleep, which is characterised by eye movement, shallow and rapid breathing, and relaxed muscles. This is when the clearest dreams occur because of your brain's increased activity. Stage 5 provides energy to your brain and body for the day ahead. Everyone has different sleep needs, but the vast majority of people need between seven and nine hours of quality sleep each night to perform at their peak every day. Light, temperature, noise and an uncomfortable bed can ruin sleep quality. An insufficient amount of quality sleep can cause memory loss, irritability, slower reflexes, and an increase in stress and illness. Losing only 15 minutes of quality sleep can result in as much as a 15% loss of efficiency. Losing just one hour of sleep can increase your chances of having a car accident by 7 to 8%. How Big A Mattress Should I Choose? It's advisable to choose the largest bed your bedroom can accommodate. The length of the mattress and bed should be 10 to 15cm longer than the tallest person sleeping on it. The table below shows Australian mattress sizes; measurements can vary slightly between manufacturers. If you lie on your stomach, a firm mattress will help keep your spine aligned. A mattress of medium firmness is generally best if you sleep on your back. It'll provide support for your spine, back and neck, as well as extra comfort. A soft mattress is best if you sleep on your side because it'll support and contour to your body's curves. A mattress' padding provides the comfort. High-end mattresses use exotic and comfortable materials like silk, wool, cashmere, premium foams and latex. At the cheaper end, materials include lower grades of foam and rebonded cotton fibres. Spring: Standard inner-spring mattresses comprise of a core of metal springs covered by foam and padding. The springs (also called coils) are the part of the mattress that support you and determine the mattress' lifespan. This depends on the number of springs, their shape, wire thickness, the way they're arranged and the number of turns in the springs. Latex: Mattresses made of latex (natural rubber) are expensive but can be expected to last up to 20 years, around double the normal lifespan of a spring mattress. Latex mattresses are less likely to carry mould and bugs, which is a benefit for allergy sufferers. 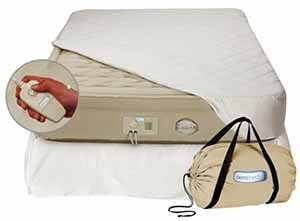 Memory Foam: A 'memory foam' mattress will keep your shape for a while after you get off it. Also known as 'viscoelastic', this special foam mattress reacts to your body heat and weight, and supports you evenly to help avoid pressure points and bedsores. Foam:It's possible to find higher quality foam mattresses, but many offer little support and shouldn't be slept on regularly. Instead, they can be an inexpensive solution for occasional use in a spare bedroom. Buying a mattress is an important investment, particularly for your health, so take your time when testing in-store. Lay on each mattress for at least 10 minutes to get a feel for it. When lying down on a mattress, relax into your normal sleeping position. The mattress should support your entire body and take your shape. There should be no space between you and the mattress. If you're lying on your back, your spine should be aligned properly with your body, and there shouldn't be a gap where your back arches. If you're buying a mattress that you'll be sleeping on with a partner, test it out with him/her. A good mattress should prevent you from rolling into each other. The specifications of the mattress are important, but not as important as what you find most comfortable.